when i got to studio w today at about 2:35pm to set up for the slam, the people running the place had no clue what i was talking about or why i was there. they did not know about the slam that we had been promoting with their name (perhaps that means we need better promotions, or they need to pay better attention) and slated to begin in 1.5 hrs. i stayed calm. it was a crazy moment indeed, because i had not set up the contact with this venue, so i had no real idea what had or had not been agreed upon and set in motion on their end. we couldn’t have the slam there. what to do! we called our friends at The Fridge DC and they hooked us up royally, on the fly. go on the horn. tweeted the nation. moved the slam to an eastern market alley art gallery. about 50 people made their way over there to see the slam. crisis averted. and magic happened, with amazing art in our eyes and ears as the young poets tore the stage down to pieces. thirteen amazing young poets in the first round. we then took the top eight into the second round, combining scores from the first and second round to then get a cumulative score to determine the top three “winners” of the night (according to five random judges in the audience using numbers to rate poems). hbo def poetry jam and national slam champ poet/actor/sign-reader regie cabico served as the master of ceremonies. 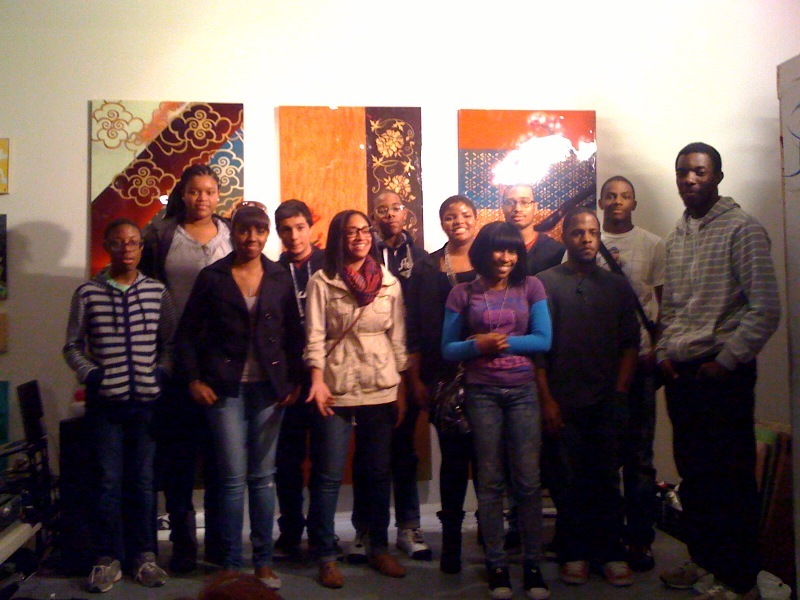 he coached the dc youth slam team for several years recently and still works closely with us. our featured poet for the evening was 2011 slam team member POETIC HYST. she brought a friend to play guitar and it rounded the set out very nicely. 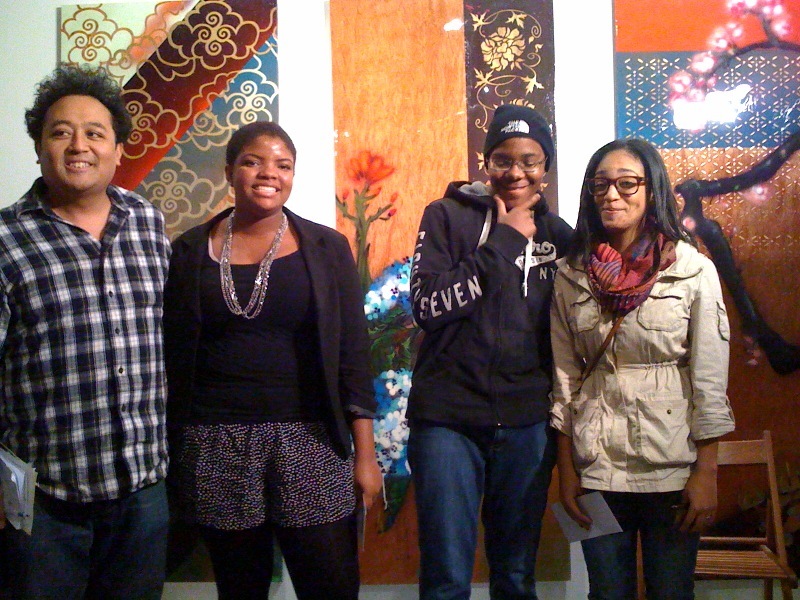 above you see (from l to r): host regie cabico, 3rd place winner ashlynn, 2nd place winner zuma, and 1st place winner amber. all of the students were invited to submit poems to Split This Rock’s Student Poetry Contest THE WORLD AND ME. see the fly-er flier below. you too, are invited, to invite your friends who are under 18 yrs old to submit their poetry online to this contest. Next Post Dear David: a poem to the Jewish Star.